If you love burgers as much as we do, you know that your condiments can totally make or break the meal. We love this special sauce that turns ordinary hamburgers into the best ever burgers! Mix Hellman's Real Mayonnaise, pickle relish and ketchup to make our special sauce. Grill your burgers as desired. Top with special sauce and garnishes of your choice. The creamy Hellman's mayonnaise is the perfect base to any sauce to ensure a delicious burger every time. CREAMY SRIRACHA SAUCE: combine 1/2 cup Hellman's Real Mayonnaise with 2 teaspoons sriracha. Makes 1/2 cup. RANCH & BACON SAUCE: Combine 1/2 cup Hellman's Real Mayonnaise with 2 teaspoons cider vinegar, 1/2 cup crumbled blue cheese and 2 tablespoons of cooked, crumbled bacon. Makes 3/4 cup. 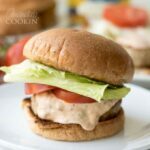 This recipe for Best Ever Burgers was printed from AmandasCookin.com - https://amandascookin.com/best-ever-burgers/ and can only be printed for education or personal use.